The sustained success of vaccines and control of vaccine-preventable diseases depends on a well-functioning routine immunization (RI) system. However, there is no “one-size-fits-all” approach for strengthening RI, and MCSP recognizes that the priorities and challenges of immunization programs vary across and within countries. To address this, we work closely with ministries of health and in-country partners to develop customized approaches to meet country needs. 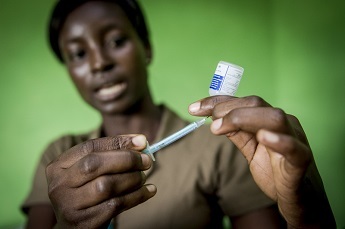 MCSP improves RI performance through a systems strengthening approach to reinforce a sustainable platform for the equitable and timely delivery of traditional and new vaccines. At national and sub-national levels, MCSP utilizes a wealth of program experience to provide technical leadership and contributes to advisory groups influencing global and regional RI policies and strategies. To sustain gains in vaccination coverage, the Program played a major role in revising the WHO Regional Office for Africa Reaching Every District (RED) approach to include a greater focus on integration, equity and community engagement so as to close the equity gap in coverage, address systemic weaknesses, and accelerate activities to increase and sustain RI coverage. The “unimmunized” and “under-immunized” tend to be concentrated among marginalized populations, in the lowest wealth quintiles, beyond traditional community structures, and – increasingly – in urban areas. MCSP implements RED across seven immunization country programs. In Uganda, for example, the Program added a quality improvement approach to enhance RED implementation. In Malawi, Zimbabwe, Tanzania and Nigeria, we improve newborn tracking, timeliness of vaccination, and defaulter tracing by applying tools to engage existing community networks, such as traditional leaders, barbers and volunteers. MCSP strengthens the capacity of in-country counterparts through improved in-service training, more effective supportive supervision with on-the-job mentoring, and peer-to-peer learning. We collaborate with medical and nursing schools to incorporate immunization into pre-service education materials, making health workers and immunization managers better equipped to deliver high-quality services.